Besides being a fan of anime, I am a dyed-in-the-wool Trekker. (And yes, I said Trekker, not Trekkie) And out of all the plot lines in all the episodes of all the Trek franchises (yes, I even liked Voyager and Enterprise) my favorite by far are the episodes where our intrepid heroes travel back in time. In fact, the whole idea of time travel (along with the headache-inducing concept of temporal paradoxes, butterfly effects, and so on) has always fascinated me. Wouldn’t it be great to travel back in time to see just how much the history books got right (and wrong)? It would certainly answer a lot of questions and ambiguities. Or, better yet, wouldn’t you like to have the power to right some of history’s most heinous wrongs? Or, never mind history, don’t you wish you could correct some of the mistakes you made in your own life? (Goodness knows, I’ve made more than my fair share, which I wouldn’t mind warning my past self to avoid) Yet, at the same time, you have to wonder: if you were to, say, prevent an accident that killed hundreds, or avert a war that killed millions, would one of those people that you saved from death end up growing up and becoming the next Adolf Hitler? Even if you limited your historical meddling to a small scale, say, warning your past self of a bad decision, is that the right thing to do? As painful and harmful as some of my past decisions were, I can’t help but acknowledge that I learned from those mistakes, and thus they helped to define who I am today. Might meddling in the past actually make things worse in the present? When I heard that the plot of Steins;gate involved time travel, I naturally took interest and added it to my “must watch” list. Steins;gate is, in fact, based on the second in a series of “science adventure games” published by 5pb. and Nitroplus. Steins;gate is the second game of this series, preceded by Chaos;head and followed by Robotics;notes, both of which were also adapted into anime form. I had in fact watched Chaos;head some time ago, and while I found it to be enjoyable, it didn’t “wow” me. So I didn’t really have very high expectations for Steins;gate, which is why I put off watching it until recently. Well, if I had access to a time machine now, I would go back and tell my past self to drop everything and watch this show RIGHT NOW. Yes, it is that good. 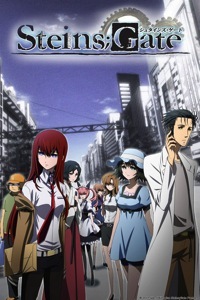 Steins;gate tells the story of Rintaro “Okarin” Okabe (aka Hououin Kyouma), self-proclaimed “mad scientist” and all-around goofball, who, together with several of his friends have formed the “Future Gadget Lab,” ostensibly tasked with inventing strange (and largely unsuccessful) gadgets, but who mostly loaf around in their Akihabara headquarters surfing the Net, attending various otaku events, playing dating-sims and doing various other random things. One day Okabe discovers that he and his gang have unwittingly invented a device that can send text messages back to the past. And that’s when everything starts going pear-shaped, in a BIG way. Plot/Story: The plot of Steins;gate was thoroughly engrossing, and not only met, but exceeded my expectations of a time-travel-related story. Obviously, since (to my knowledge) no one has yet to successfully travel through time, we don’t have any knowledge of how time travel would work; however Steins;gate’s portrayal of time travel and its effects fit with most other sci-fi stories I’ve read. In fact, if anything, the time travel shown in Steins;gate seems to make the most sense to me: sending people back to the past may be extremely difficult, but sending simple data to the past (as the Future Gadget Lab crew did) might not be too far-fetched. Aside from the time travel element, Steins;gate’s plot and story continues to satisfy. There’s plenty of plot twists and turns, not to mention a few surprising reveals. Lots of things are said and done throughout that may seem inconsequential but are later discovered to be important to the story. And in the end, the plot quite literally comes full-circle, ending right where it began. As far as pacing, the first half of the show may seem slow and random to some, but this is necessary since it sets up the plot and introduces and develops the characters. Things really pick up in the second half of the show however, as Okabe & Co. must confront head-on the consequences of their meddling with time. The level of action and drama gets kicked up several notches, but they perfectly counterbalance this with more quiet moments for character development, plus some comedy and lightheartedness to break up the tension. Characters: This is where the show really shines for me. All of the characters are quirky and interesting, and most importantly, they interact with each other as a cohesive unit. The main lead, Okabe, may put you off at first with his immaturity and absolutely insane “mad scientist” schtick, but as the series progresses, his character deepens, and we begin to realize that Okarin is much like any of us who, as young adults, have wild dreams and aspirations, but maybe lack the skills and discipline to deal with the challenges of adulthood. Furthermore we see that underneath that zany exterior lies a surprisingly sensitive soul who truly cares for his friends, and would do anything to help protect them, whatever the risks may be. Makise Kurisu is one of those strong female anime characters that are so refreshing to see. She’s female, she’s a scientist (girl geeks rule! ), and not only does she take the jabs thrown at her by the (male) characters, but she zings them right back in return. (Yeah I know this is classic tsundere, but in this case it is particularly apropos.) Mayuri, far from being the stereotypical ditz and/or damsel in distress, shows us that she in fact has a surprising inner strength that she draws upon to help keep the other characters (most notably Okabe) on track. Daru, the overweight hacker and uber-otaku serves mostly as comic relief, but even he is revealed to be far more than what he seems as the story progresses. Likewise the other characters, though not as developed as the leads, nevertheless add to the story; there are no real “throwaway” characters to be found here. Ultimately you get to know and like these characters as you watch them stumbling around at first but eventually coming together as a cohesive unit, and you find yourself rooting for them, feeling for them as their decisions bring about unexpected consequences and tragedies, and hoping and praying that things work out for them in the end. Animation: Thanks to modern technology, animation is easier and cheaper to put out than ever before. Still, all too many companies manage to find ways to royally screw things up anyways. Fortunately, Steins;gate is not one of these. The animation is smooth and beautiful, richly detailed and very expressive, and really helps show off the various locations in Akihabara where the story is set, and the level of details in the characters’ faces really help convey their thoughts and emotions. The color palette, lighting and shadows really help set the tone of the show as well. Sound: Steins;gate has some of the best OP and ED music I’ve heard in a while. The OP, Kanako Ito’s “Hacking to the Gate” (translated lyrics) hits like a hammer and powerfully echoes Okarin’s defiant anti-“Organization” attitude and his determination to stop at nothing to protect what is precious to him; while the ED, “Tokitsukasadoru Jūni no Meiyaku” (刻司ル十二ノ盟約) by Yui Sakakibara (translated lyrics) echoes that determination but brings in a touch of melancholy hinting at Okabe’s desperation as events spiral out of control. The incidental music used throughout the series doesn’t stand out in particular, but it definitely lends itself to setting the mood and accenting dramatic or emotional moments. Dub: The dub is, in a word, phenomenal, and really goes to show how far we’ve come in terms of the quality of today’s dubs, and the attention to detail on the part of the translators. It also serves as a shining example of the quality of work on the part of the voice actors themselves. It’s clearly evident when a dub cast has done their homework and really understand the characters that they are portraying, and it’s just as painfully evident when they have not done so. In this case, the dub cast clearly understood the characters they were tasked to portray. In particular I was impressed by J. Michael Tatum and Trina Nishimura’s portrayal of Okabe and Kurisu, respectively; they clearly understood the roles they were asked to play, and more importantly, they played off each other beautifully. But the rest of the cast deserves ample credit as well. I should also note that the translators did a good job translating the various geek and otaku references used into ones more readily comprehensible to Western fans. Packaging: FUNimation decided to release Steins;gate in a 2-part DVD/Blu-ray combo which, while beautifully put together, is a bit of a pricy proposition. Separate DVD and Blu-ray releases might have been a better idea; not only would a separate single-media release be cheaper, but then we wouldn’t have the problem of shipping unwanted/unneeded disks to people. Being a PlayStation3 owner I am naturally interested only in the Blu-rays, and the DVD disks are pretty much useless to me; while DVD-owning viewers (of which there are still very many) would probably say the same of the Blu-ray disks. Having said that, the package is nicely put together, with the 25-episode series split across four DVDs/Blu-rays; this means each disk has around six episodes on it, meaning the encoders don’t have to overdo it on the digital video compression to get things to fit (this is especially true in the case of Blu-ray, which has far greater capacity per disk than DVD). The encodes were crisp and clean, and the same goes for the audio. There are also some interesting commentary tracks from the various voice actors as part of the extras. Volume 1 is also available in a Limited Edition variant that includes an attractive art box that holds both volumes nicely. Finally, FUNimation is also streaming the series in both subbed and dubbed variants on their website. The Good: A powerful story that would satisfy any science fiction-loving nerd, with strong characters that mesh well together, and more twists and turns than your average roller coaster. Here’s an opportunity to review anime – Secret Santa style!